Chris Giarusso Discusses G-Man, his Work and the Future! In the land of comic books, there are people who draw and illustrate, those who color, those who write and craft stories and then there are a select few, like creator of beloved character G-Man Chris Giarrusso, who do all three and more! We caught up with Giarrusso at this year's Heroes Con, and talked with him about his work, his influences and what he loves hearing from fans of his work. Giarrusso's unmistakable and unique style is easily recognizable to fans of his Mini Marvels series and with his creation G-Man. Starting out at an early age, Giarrusso said of his development as an artist, "I started drawing as a kid, copying anything my brother was drawing, and he was often copying comic strip art. So I copied him and then I eventually started trying to learn how to draw all of Charles Schulz's Peanuts characters. Then I went through my superhero comic book phase where I was trying to draw like Jim Lee, and I found it far too frustrating and disciplined to figure out." While he admits to being self-taught and directed, he sees his art as his own and something that is unique. With that style of drawing came the many Marvel Minis series, which helped to put him on the map for many readers, and his work quickly found an audience. 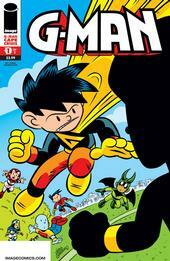 With the success of Marvel Minis, in many forms and compilations, came Giarrusso's own creation, G-Man, a story focusing on the heroics and trials of a young boy who, with his magic cape, gains flight, strength and more. With Giarrusso taking the helm on all aspects of the work, he had this to say about the process, "The hardest part is the time commitment. You have the work thatis usually done by four or five people being done by one. It can be done,but it becomes more difficult when you have other responsibilities. I do have my brother assisting me on colors, but it would be great if I could get an office assistant to answer phones, answer email, update my blog, manage my facebook and twitter accounts, schedule events, go to the post office, do my laundry and buy my groceries." Even with the crunch that is associated with G-Man, both volumes one and two of G-Man's collected adventures are available from Image Comics and volume three of the series is currently in works. Giarrusso promised that there are plans in store for this third volume. "I want to continue where I left off with Cape Crisis (the previous volume) and just keep telling the story of "what happens next?" But the big event is that G-Man and Great Man have a new baby brother on the way," he said. A new baby on the way for the dynamic brothers has lots of story potential, and Giarrusso admits that the development of the G-Man series is a little of both spontaneity and planning, "There are certain things that I've given a lot of thought to that I know will be in the stories, but then there are a lot of ideas that come to me organically while I'm in the middle of things." 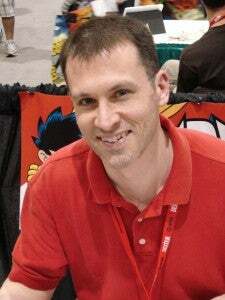 Even though his stories take place in the realm of fantasy and superheroics, Giarrusso admits that he does have hopes for his readers, of all ages, which are, "that the characters and dynamics between them are relatable, even when the situations and scenarios are ridiculously impossible. Even though these are stories about kids, adults should immediately be able to say, "yeah, that IS what it was like. And it's basically still that way as an adult." In relation to his readers, Giarrusso does always enjoy hearing from fans of his work that, "it's "the only comic my kid/wife/girlfriend will read." It's encouraging to hear I'm getting new or reluctant readers hooked." Fans of Giarrusso's should pick up either volumes one or two of G-Man, any of the Marvel Minis or look for issues of Guarding the Globe from Image, which feature Guardian Gag comic strips done by Giarrusso. Perhaps these will be the one comic that your friend/girlfriend/wife/kid reads! For more information on Chris Giarrusso and his life and work, visit the author and artist's site here!